Charms are seldom deployed in isolation. Even MediaWiki needs to be connected to a database. Instead, charms are mostly used to model more complex deployments, potentially including many different applications and connections. A Bundle is an encapsulation of this model, or an atomic self-contained part of it. It may be as simple as MediaWiki and a database, or as complex as a full OpenStack cloud. But a bundle encapsulates all the charms and their relationships and enables you to install an entire working deployment just as easily as installing a single charm, whether that's from the Juju Charm Store or by importing a previously exported deployment yourself. Note: The dry-run option only works with bundles. You can get the name of a bundle from the Juju Charm Store, just as you would a charm. Unlike charms, bundles embed more than a single application, and you can see icons representing each separate application alongside a bundle's name. This gives you a quick overview of a bundle's complexity and potential resource requirements. 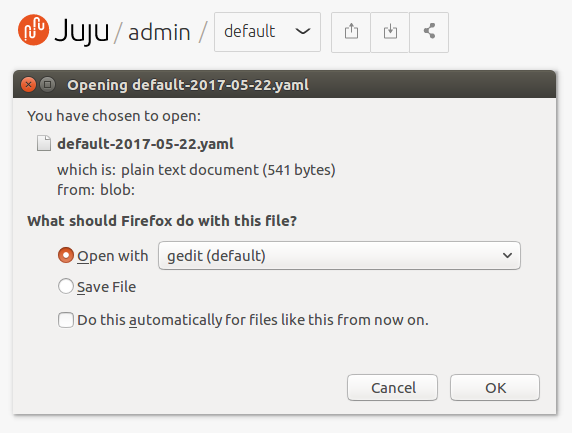 Bundles are just as easy to use and deploy within the Juju GUI, and the process of adding them from the Charm Store is almost identical to the way you add charms. A bundle is a set of applications with a specific configuration and their corresponding relations that can be deployed together in a single step. Instead of deploying a single application, they can be used to deploy an entire workload, with working relations and configuration. The use of bundles allows for easy repeatability and for sharing of complex, multi-application deployments. constraints: "arch=amd64 cpu-cores=1 cpu-power=100 mem=1740 root-disk=8192"
To make your bundle as reusable as possible, it's common to set minimum constraints against a charmed application, much like you would when deploying charms from the command line. This is a simple key addition to the application definition, using the proper constraint key/value pair as outlined in the 'constraints' documentation. When deploying an application, the charm you use will often support or even require specific configuration options to be set. These options can be set in a bundle as a simple key addition to the application definition, using the configuration key/value pair. See the documentation on application configuration to discover which options are available for the different charms. You can co-locate applications using the placement directive key in the bundle. Much like application constraints, it requires adding the placement key to in the application definition. Where supported by the cloud provider, it is also possible to isolate charms by including the container format in the placement directive. Some clouds support LXD. Bundles may optionally include a machine specification, which allows you to set up specific machines and then to place units of your applications on those machines however you wish. A machine specification is a YAML object with named machines (integers are always used for names). These machines are objects with three possible fields: series, constraints, and annotations. Note that the machine spec is optional. Leaving the machine spec out of your bundle tells Juju to place units on new machines if no placement directives are given. constraints: "arch=amd64 cpu-cores=4 cpu-power=500 mem=4096 root-disk=8192"
which will install one unit of the MySQL application on machine 0 and the other on machine 1. These bundles will need to be updated to be more specific about the bindings required, allowing the operator to specify exactly which charm-defined endpoints should end up in specific spaces. If this charm were to be used as part of a bundle, it might be desirable to specify a revision that is specific to the bundle. Revisions are specified in the bundle's YAML file in the corresponding "applications" section. The example-charm charm specifies that it requires a resource called example to operate; the bundle's "applications" section shown above specifies that its bundle requires, from the charm store, revision 1 of that resource. Local paths to resources can be useful in network restricted environments where a Juju controller can not contact the charm store, for example. After you have tested and deployed your bundle you need to release it to share it with people, this is covered in the charm store documentation. Someone will come along and review your bundle for inclusion. If you need to speak to a human, there are patch pilots in the Juju IRC channel (#juju on Freenode) who can assist. You can also use the Juju mailing list.